La 28ème Charly Gaul is organized by the ACC Contern on Sunday, September 3, 2017. 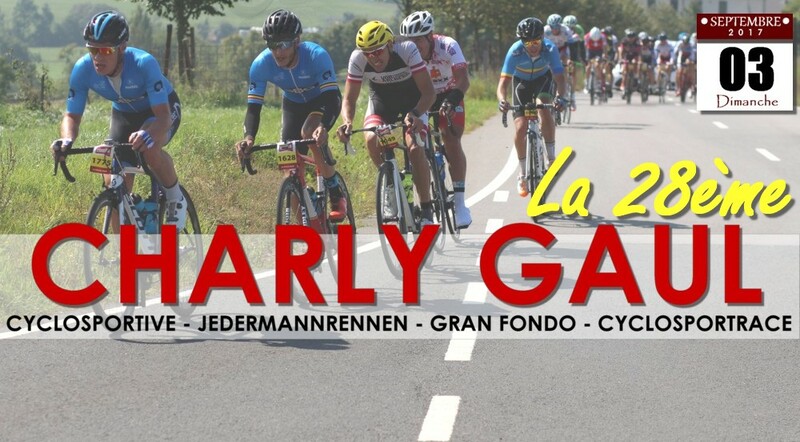 It is a cyclosport-race (brevet cyclosportif) authorized by the Luxemburg Cycling Federation (FSCL) and is open for every cyclist older than 14 years. Each participant has to fill out a registration form and pay the registration fees, which contain the participation costs as well as the security and food and drinks on the course. The registration form can be filled in and posted on our internet http://www.lacharlygaul.lu, or can be send by post, fax or e-mail. It can also be remitted personally at the handing out of the back-numbers before the race in Echternach. Payment of the fees at a reduced price is only possible in case of advance payment, per credit card at the registration on our internet site http://www.lacharlygaul.lu, or per bank transfer on the account number LU48 0020 1417 6800 0000 of ACC Contern at BILLLULL. The fees can also be paid at the full price, cash on Saturday or Sunday before the race. Reimbursement conditions in case of advance payement and non-participation are following: please send an e-mail with your name and your bank account to acccontern@gmail.com before Thursday, August 31, 2017. After August 31, 2017, only messages with a medical certification will be taken in account for a reimbursement. The organizer has the right to decide about a possible reimbursement or not. By his registration, each participant aknowledges the present regulations If these rules are not followed by any participant, he can be disqualified. The riders are considered as normal traffic participants and have to apply strictly to the traffic regulations. If they don't, they will be responsible for any possible caused damage. The organizer is not responsible for any damage The participants have to wear a helmet during the entire race. The course will be indicated by signs and has to be followed strictly. Random controls can be performed on the course. A rider that has not passed at a check point will not be listed in the regular result lists. Each participant has to cross the start line after the official start in order to be listed in the result list. Times are taken at the start/finish line. Following the rules of the ministry for transport, riders that are more than 1 hour behind the leader will be informed by a car of the organizer ("FIN DE COURSE"). At that moment, the streets and crossroads will no longer be guarded by the police or race marshalls, but the riders can of course finish the race according to the traffic regulations. If they do so, they will appear on the result list. Assistance cars are not allowed on the course. Participants that are followed by support cars will be disqualified. Participation diplomas can be downloaded after the race via Internet on http://www.lacharlygaul.lu. The distance of the race is 162 kilometers. A scratch classification is established as well as separate classifications for different categories. The categories are following: A: women 14-17 years / B: women 18-39 years / C: women 40 years and more / D: men 14-17 years / E: men 18-29 years / F: men 30-39 years / G: men 40- 49 years / H: men 50-59 years / I: men 60 years and more. Race-jerseys, gifts and cups will be handled out to the first riders in the scratch classification as well as in the different categories. The distance of the race is 102 kilometers. A scratch classification is established as well as separate classifications for men and women.